The rooster who was attacked by one (or more?) or the other young roosters on Friday made it through Saturday, but died yesterday morning. He just didn’t survive those brutal injuries. As there was no other factors, whilst we didn't eat him. We didn't want his death to go to waste. So on the upside the dogs were well fed yesterday. For an animal that can be so friendly and in the case of the ducklings, so nurturing, they are brutal. To be honest I still don’t fully understand it. I know roosters will challenge and may fight, but I haven’t really experienced it, particularly at such a young age. I our aim to replenish our laying stock, we subsequently hatched and raised a few roosters. These have either found a new home, or destined for the pot. 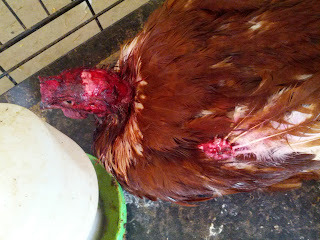 None have had contact with our older resident roosters (to avoid any challenge of this kind). But til now, we had found with sufficient room and food the roosters could be raised til big enough without any trouble. This rooster was probably one of the more dominant and cheeky. He was first in the food and would even come out to greet and peck me, as I brought in their feed and water. My guess is he was challenged and just did not submit; I found him curled up behind the feeder. So yesterday, after letting the roosters range, I set them up in the temporary duck run. Which should give them more than enough room for another few weeks, since its only currently inhabited by two ducks. This did involve setting up a few garden nets over the top- to prevent them roosting in my neighbours trees (as they are a little close- and Old English Games a renowned for it). They appear to have settled in quite well. Fingers crossed that we don’t have another incident like that.